The “jungle” is here to stay, according to Jim Thomson. Just days after the demise of the Newmarket Hurricanes was announced, the owner of the Aurora Tigers Junior A hockey club, renewed the team’s commitment to Aurora. 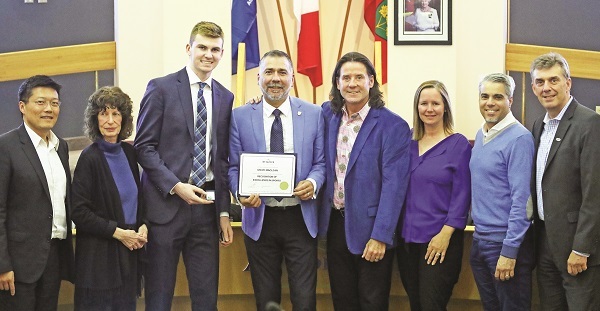 Mr. Thomson appeared at Council last week to not only renew the team’s commitment to the community, but also to honour player Steve MacLean, who was honoured by the Town with the Town’s Excellence in Sports award. MacLean was recognized for his commitment to the Tigers and the community that calls the team its own, always rising to the occasion and lending a helping hand to the myriad community initiatives the Tigers have taken on; everything ranging from special bag-your-grocery days at local shops to ongoing work with the Aurora Sports Hall of Fame. The work of MacLean and the rest of the roster, he noted, is part of the Teamwork the Thomsons – Jim and wife Rita – have worked to bring to the team. But, sustain it they have – and it’s a commitment they intend to keep. Over the past few years, Mr. Thomson said twelve of their players have received scholarships, two players have been drafted into the NHL and, at the end of the day, that is what the Tigers club is all about. The exit of the Hurricanes, however, is, in a way, an opportunity for Aurora, according to Mr. Thomson. But it’s only a great idea if it gets people to come out to a game. At a recent meeting of Newmarket Council, Mr. Thomson said he was struck by an exchange between Mr. Taylor and another Council member. When the Council member asked for a status update on the Hurricanes, the Mayor asked when they had last been to a game. In the case of the Tigers, the Thomsons have been working to right the ship as far as attendance is concerned. After increasing the ticket prices by $2 last year, they are lowering them by $4 to $10 a game this season to drum up some excitement and interest.